I honestly meant to put this post up yesterday (Friday) but it turned into a surprisingly busy day, so sorry about that. • We had our regular Friday neighborhood potluck (it was our turn to host). It was full house this time -- five families, 14 people total -- and we had a lovely visit. I know I've said it again and again, but I can't help it: we are blessed with wonderful neighbors. These weekly potlucks we've had for the past eight years are a cement that has bound us together in ways that are hard to describe. 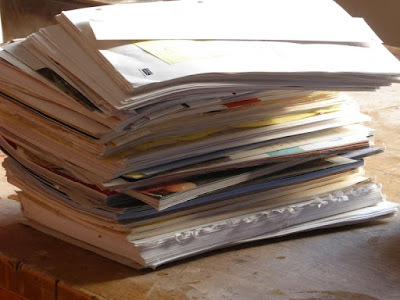 Some people in our group are experiencing serious health issues, so as spring unfolds we'll be pulling together and pitching in on chores and tasks that need doing while they recuperate. It's what neighbors do. It's the third leg of preparedness -- community. 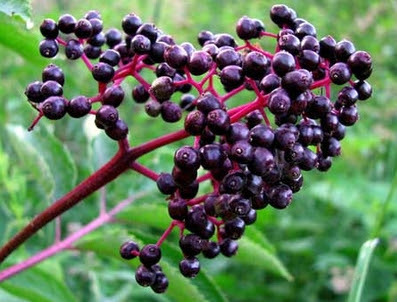 • Another of these neighbors experienced a first: making elderberry jelly. She has an elderberry bush in her yard and had frozen much of the fruit, so this week she decided to try her hand, for the first time, at making jelly. It worked and she was thrilled. Food preservation -- a good thing to know! • This same neighbor and I signed up to attend a gardening seminar in March. Among the classes offered are pruning and permaculture. I don't know much about either subject, so it will help to increase our knowledge. 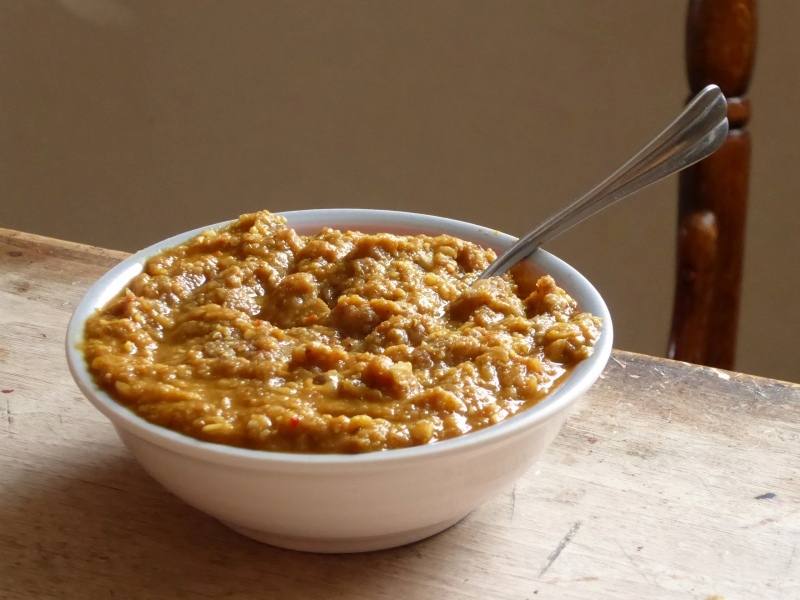 • I learned a tasty new way to cook legumes (specifically lentils). Since legumes are one of the best prepper foods available (cheap, nutritious, versatile), having attractive ways to prepare them is important. • I took Lydia to the vet. She's coming up on eight years old, and suddenly started limping and lifting her left front paw. Turned out to be arthritis, so she's on some temporary anti-inflammatories, as well as more permanent glucosamine/chondroitin. If her antics and energy levels are anything to go by, she's feeling like a puppy again. The vet confirmed she's in excellent health. 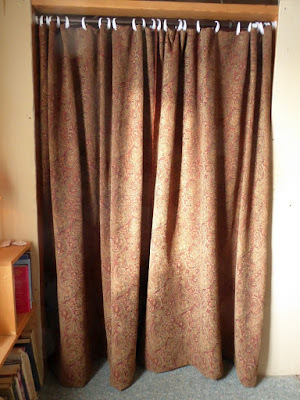 I absolutely love how these curtains look. I keep stopping to admire them. As the artist William Morris once observed, "Have nothing in your houses that you do not know to be useful or believe to be beautiful." These curtains fulfill both those requirements. ...and fit it neatly into the file drawers. 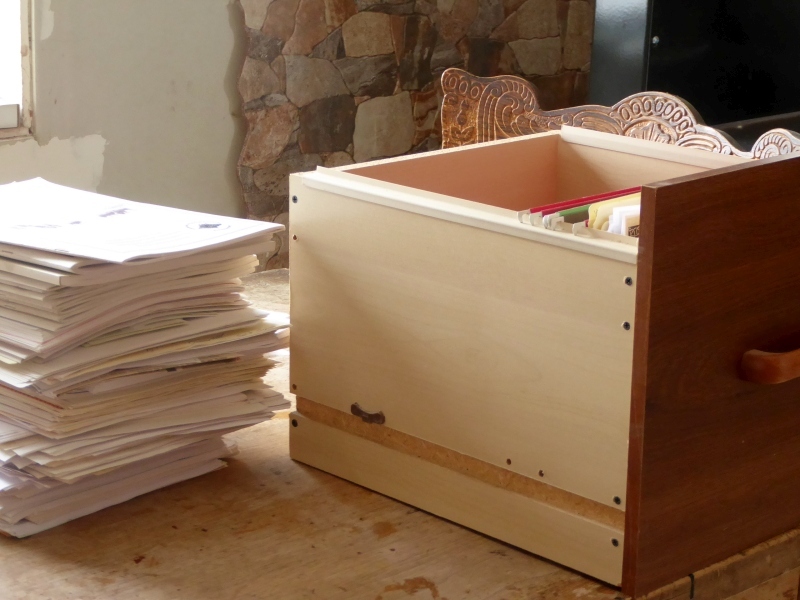 Whoo-hoo, no more big honkin' banker's boxes taking up closet space! 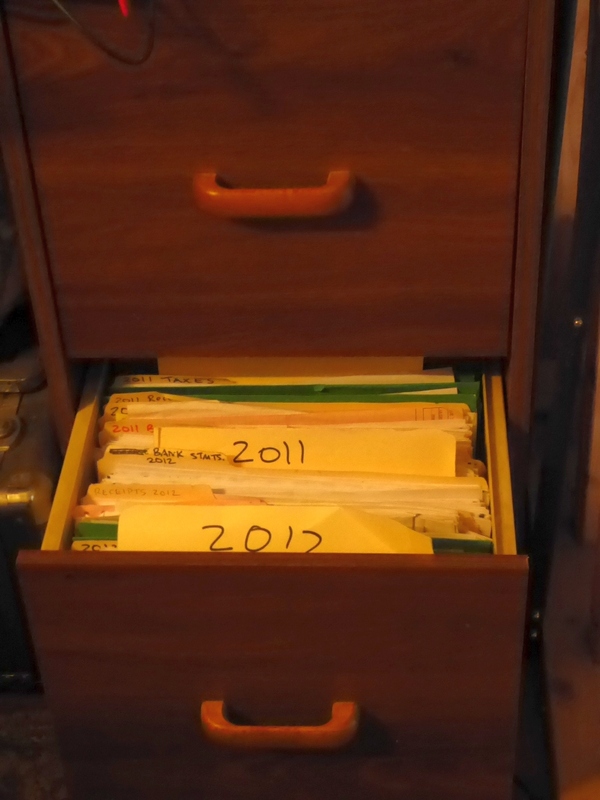 • I also emptied TEN binders of paperwork (old articles, writings, clippings, seminars, workshops, etc. ), some of which were 20 years old. Why on earth was I holding on to this stuff? 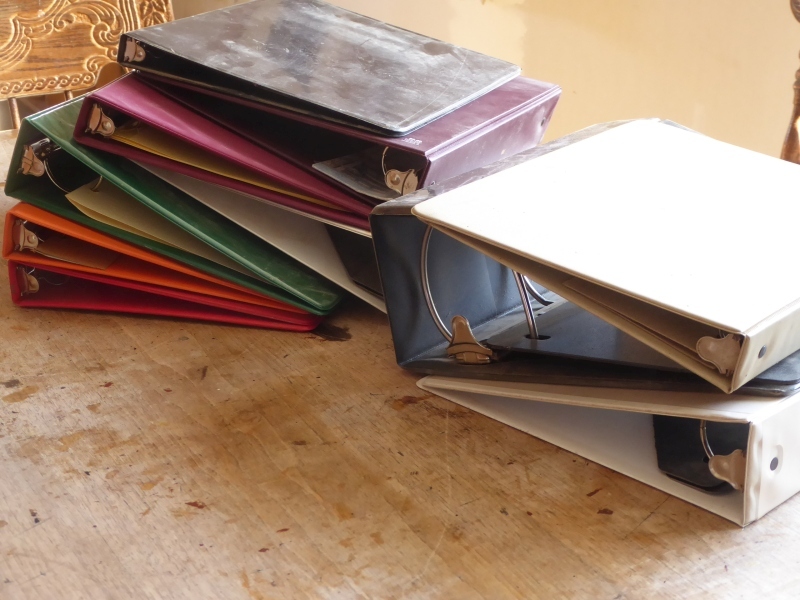 I kept a couple of the empty binders and donated the rest to a thrift store. • I also took a trip down memory lane and purged our extensive collection of children's books. 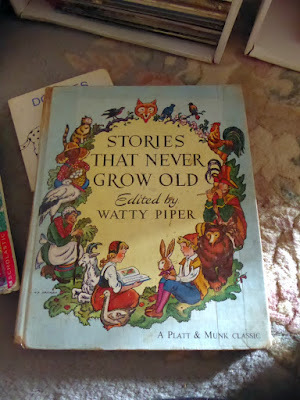 Now before my kids see this post and FREAK OUT, rest assured I kept all our beloved childhood classics. 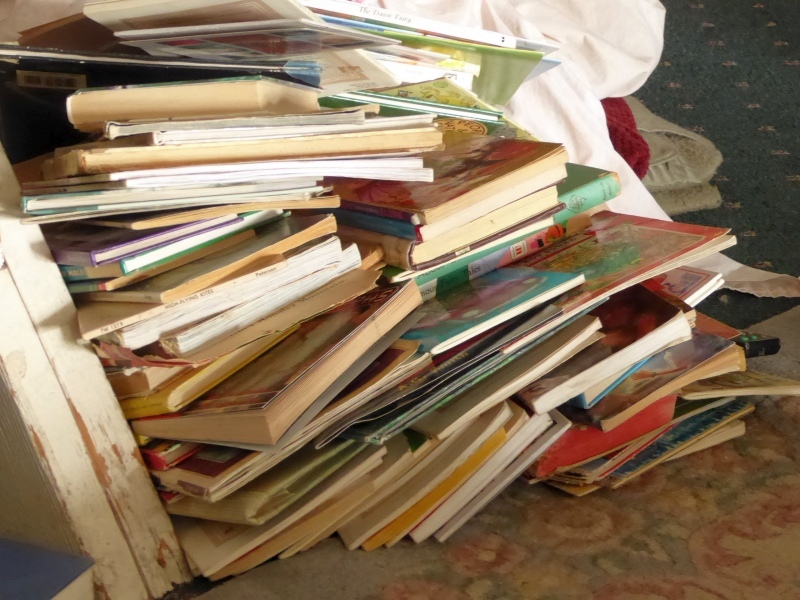 We have a rich treasure-trove of excellent children's books, and I have no intention of discarding them. 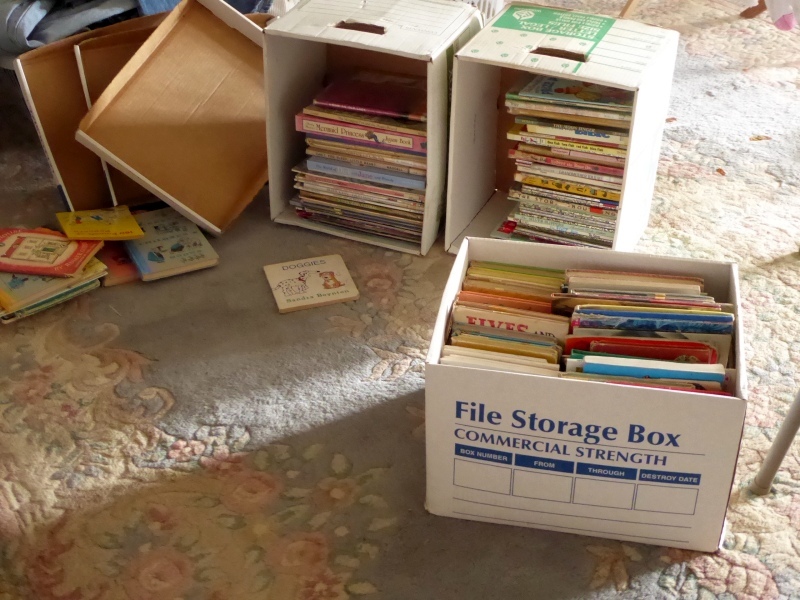 What I got rid of were books they never had much interest in, or duplicates, or are so commonly available that holding onto copies was pointless (don't worry, I kept every Dr. Seuss book). You know how much all the discarded books weighed? Sixty pounds. 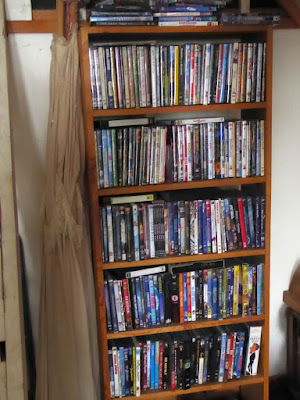 • I also took a good hard look at our collection of DVDs. I withdrew the movies I thought no one was interested in. Then I had both Don and Younger Daughter hold back ones they wanted to keep. In the end I got rid of 75 DVDs. SEVENTY-FIVE. 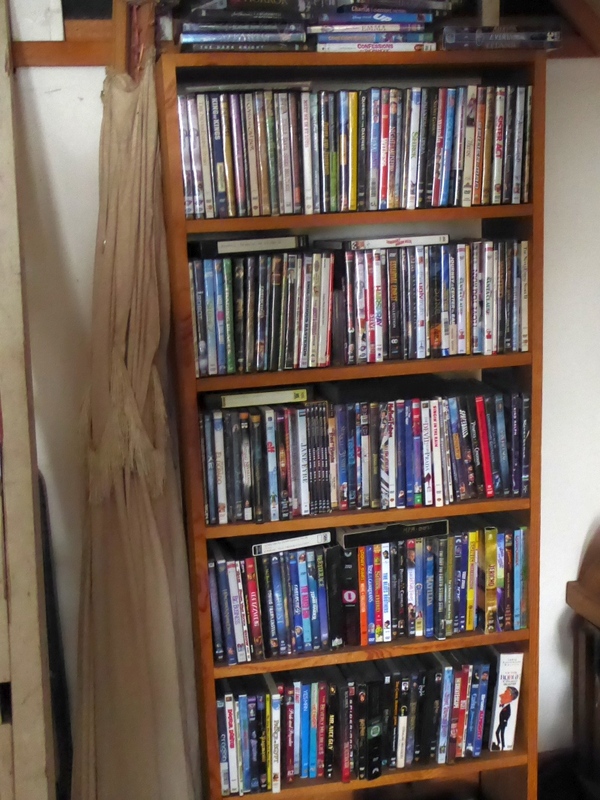 How on earth did we accumulate 75 superfluous DVDs? The answer: thrift stores. Friends. Freebies. 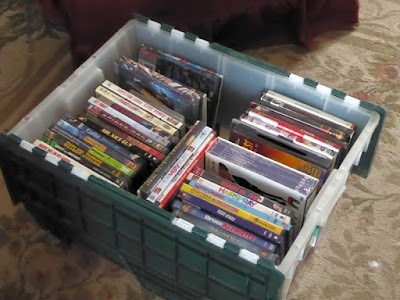 We kept the movies we thoroughly enjoy watching over and over (ahem: Jane Austen) and donated the rest. • Don also took a dump run. We have no garbage service around here, and during the icy weather we couldn't take the farm truck on the road (too dangerous). Now the accumulated garbage is gone, leaving a feeling of "Aaaahhh." So that's been our roundup over the last two weeks. What has everyone else done, big or small, to increase self-sufficiency? I got some of my garden seeds started. It been in the 60s, so I've also been cleaning up the garden area. Talked to hubby when we went to order new tires for my car about picking up some tractor tires for our new strawberry beds. We also noticed some large (wolf?) canine prints down at the creek when we were out walking and went back yesterday to set up a trail camera to see if we can figure out what has been down there. 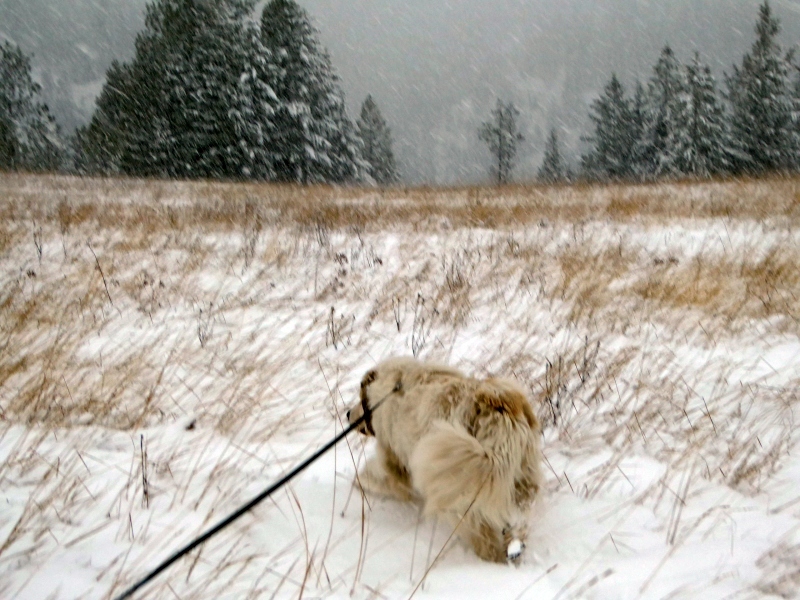 There aren't supposed to be any wolves this far east in our state. I also got some free sweet peppers to dehydrate, as the person that gave them to me mistook them for hot peppers (they do look like chilies). For your girls size the dog glucosamine products are expensive. If she's easy to pill just buy the human versions. I paid half the cost of the dog supplements when I was giving my Boxer them. LOL -- we get the stuff at Costco. Bless the vet, that was her suggestion. We tried them from Costco for our dog. They upset her tummy, even one-half. So back to the doggie chewables. I live in lower Alabama and got the green light to plant certain things. I planted dwarf white peach and fig trees (they can reach a max of about 8 ft tall). Also planted 2 Blueberry bushes, and a garden full of cool weather itmes including cabbage, brussel sprouts, cauliflower etc. Planted Yukon potatoes. Purchased sunchoke tubers to plant. Researched and purchased natural privacy covers (a vine to take over the fence) Visited a new friend at the end of my country road. One result of that, is that she is sending her husband to my house to drop off some leftover shingles they have, since several of mine blew off in the last wind storm! I also had 2 metal sheds delivered. I researched solar power systems online, and will be making a big purchase soon. This will allow me to reduce my power bill to almost nothing, while keeping my heat, cool, and lights going when (every time) our village power grid fails. P.S, my itty bitty yapper pup is 10 yrs old and has arthritis. I give her baby liqud ibuprophen for particularly stiff days, and daily doses of salmon oil with the arthritis med added. This can be bought at Walmart in the pet section. You are motivating me to do some purging. I am going to start with some old files that I know can all be trashed. Glad Lydia is feeling better! We had a Great Pyrenees and he was such a good guard dog. I love seeing your pictures of Lydia... reminds me of our Teddy. I got the black plastic down on the garden to warm the soil quicker come spring (we had a thaw and have no snow on the ground this weekend - and it should hit 60 degrees today! Bizarre for MI in Feb, but I'll take it). And go the black plastic stapled around the outside of the hoop house. And got stung by a crabby honeybee for my trouble. And we got the new clear plastic over the hoop house and when I'm done here, I'm going to go out and finish attaching it before it gets windy (which will make it impossible for one person to accomplish alone, since DH is working today). Then I'm going to lay down in the sun somewhere and take a nap. I hope. I purchased some jerusalem artichokes and planted them way away from the garden as they are supposed to be invasive. I need something like that to sustain themselves through out our summer. I have been trying to do this to my house. Girls have finished home schooling ages ago so am trying to get rid of books and what seems like thousands of notebooks. Sometimes it seems the job is bigger than me. Goodness, who is having both the pruning and permaculture gardening seminar?! I have tried to find one that put both together for quite some time. Thanks so much for all your wonderful updates and info. It most certainly keeps many of us motivated to keep up with the Lord's good blessings! Well, I suppose that answers the question as to why I could not find one with both topics locally...lol! I'll look into that one and thanks so much for the heads up! the grapevine and blueberrys were delivered...way too early to set out, so they will be in a bucket of damp potting siol for 90 or so days. canned 8 pounds of ground beef that were approching their freezer life limit...10 pints. dehydrated 4 packs of frozen corn..26 oz each..for long term storge. looked longingly at the roto tiller...still too wet to do more than wish..
My comments here and elsewhere keep disappearing so I apologize if this is a duplicate. A word of warning on the anti-inflamitory. Just like for humans, they can cause digestive upset, ulcers, kidney problems, etc. and just like for humans some dogs are more sensitive than others. Back at the end of the summer we had to put our Tibetan Mastiff on one after he strained his "wrist" goofing off. He wasn't on it that long as such things go, but it turns out he's one of the dogs who's more sensitive and developed a really bad ulcer. Really really bad. My vet said most dogs with ulcers are back to normal in a couple weeks of treatment (unlike humans), but for Apollo it was over two months of bland diet, high test antacids, and chalky stomach coating stuff. I try to not be overly alarmist about such. But if you notice her off her food, even a little, during the course of anti-inflamitories or shortly after, give your vet a call. I certinally wish I'd caught it that early! Oh, thank you, Ruth, for confirming my suspicions on the Costco chon/gluco I waas giving my Dobie. We took her off after she would go graze on the alfalfa scatters and just act sickly. Can't comment on the Chon/gluco supplements, (though apparently not all such contain what they're labeled to contain, so if you're having issues you might want to change brands.....), but I was referring to actual anti-inflammatory drugs. Ibuprofen for us humans, Rimadyl for the dogs. Its a standard hazard for both human and animals with these drugs, but of course our dogs can't tell us that their stomach is being screwed by it. In the last couple of weeks I've planted about 30 blackberry bushes and 3 figs (the blackberries are replacing what the power company sprayed herbicide on the last time they came through doing power line right-of-way maintenance). Today it's a pre-season spray of copper on my apples, pears, and peach trees. Here in GA, things are coming out of dormancy. This last week I cleaned out and filled two jugs with water. I also cut up an old bath towel for the children to use as "tissues". =) It's been warm this past week, but we don't trust the weather here until May for gardening stuff. that was a pic of elderberries? someone told me the wild plants in my back yard that look just like that are poke salad. Each year I save some seed and then scatter it ito make sure it grows again the next season. I think it is a pretty plant. The birds, squirrels, chipmonks like it. What do the robins know?